Philippe Starck defines him as a “mystic in a country which is no longer mystic.” Philip Drew calls his buildings “land art” as they “struggle to emerge from the earth.” His designs have been described as haiku crafted from concrete, water, light, and space. 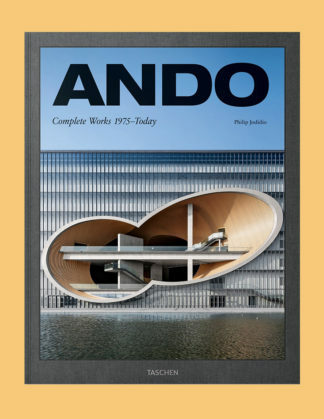 But to Ando, true architecture is not expressed in metaphysics or beauty, but rather through space that embodies physical wisdom. This thoroughly updated 2018 edition spans the breadth of his entire career, including such stunning new projects as the Shanghai Poly Grand Theater and the Clark Center at Clark Art Institute in Williamstown, Massachusetts. Each project is profiled through photographs and architectural drawings to explore Ando’s unprecedented use of concrete, wood, water, light, space, and natural forms. Featuring designs from award-winning private homes, churches, museums, and apartment complexes to cultural spaces throughout Japan, Korea, France, Italy, Spain, and the USA, this XXL-sized tribute is the definitive overview of this Modernist master.